This ProPac premium CERT backpack was designed for durability and includes detailed features specific to CERT teams and their emergency response needs. 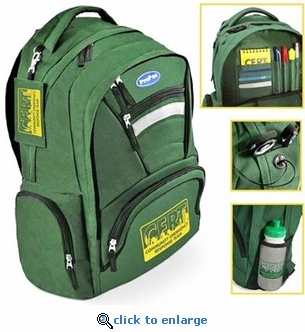 This green CERT backpack with multiple padded pockets and a moisture-resistant lining inside will protect and keep your gear organized and ready for any emergency response. Material: Nylon canvas shell woven with 600 Denier cord for added strength. Divided inner pouches for small items. Outside mesh pouch for a water bottle or tools. 1/2" thick padding straps and back for long lasting comfort. Ergonomic "S" curve straps adds comfort and stability. Heavy duty SBS #5 coil zippers. Oversized fabric zipper pulls - no need to remove gloves to unzip. Reflective stripe for added safety. Headphone port: Keep your radio dry while you stay in touch. CERT Logo imprinted on back. Clip-on CERT tag to hold ID card.